This project is one of the first Pixel and Timber products of 2018. This powerful new tool borrows e-bike technology and the latest advances in thin kerf bandsaw blades to empower woodworkers to harvest their own lumber from urban trees felled due to disease, clearing or severe weather — turning an otherwise wasted resource into beautiful, sustainably harvested lumber. Most of the time, when a tree comes down or is taken down in your neighborhood — due to disease, severe weather, or removal — it is diced into manageable logs and hauled away to the nearest landfill. The landfill waste associated with managing urban forests is significant. Reclaiming this otherwise wasted urban wood for use as lumber is an opportunity to both reduce urban wood waste and reduce the cost of creating beautiful wooden objects for use or sale. For woodworkers, the idea that any amount of valuable hardwood — let alone beautiful character wood with a story behind it — is being deposited in a landfill is a travesty. According to the U.S. Forest Service Education and Resource Center, "reclaimed wood from all dead and diseased trees could equal nearly one quarter of annual hardwood consumption in the United States." What isn't dumped in a landfill is most often recycled for firewood or mulch. And for arborists, this waste is a missed opportunity to turn cost into profit. According to David T. Damery & Brian C.P. Kane of the University of Massachusetts, "finished wood products can bring as much as $100 per pound of material at the retail market place. Contrast this with the $90 per ton cost for tipping fees when disposing of wood debris." Hobbyists and professionals alike, woodworkers all over the United States are looking for affordable, local and sustainable sources of hard and soft woods to support their projects. Urban wood may be the answer to this need, and arborists and local sawyers are beginning to see it. Chet Amrstrong, who holds a degree in Forestry, is a certified Master Logger, president of the Missouri chapter of the Walnut Council, and manages the 2006 Missouri Tree Farm of the Year. He also owns and operates a portable saw mill with which he reclaims urban wood that would otherwise be converted to mulch or firewood and converts it into usable lumber. According to Mr. Amrstrong, "Operating a band saw mill is, in many ways, similar to organic gardening. First, it is local – Woodworkers especially like having an option to use local species that never make it to lumberyards, such as honey locust, sycamore, Osage orange or elm. Not every board is perfectly clear, just as not every tomato in an organic garden is free of blemishes. What the local trees give is character, and woodworkers love it." While reclaimed urban wood may be available to those who know their community arborists, for those who do not, this resource is inaccessible. And while many companies produce portable saw mills that could give woodworkers themselves the capability of harvesting fallen timber, no such device has been designed specifically for their needs. Converting urban wood to lumber is not limited to commercial saw mills. Several companies offer "portable" saw mills with which even individuals can convert fallen wood into usable boards. Two primary types — portable bandsaw and the Alaskan saw mills — are the most accessible options for woodworkers who wish to harvest their own timber. However, for reasons of size, cost or other issues, neither type is well tailored to the needs of the hobbyist woodworker. The portable bandsaw mill is exactly the tool a woodworker needs to turn fallen timber into usable lumber. With their thin (1/8") kerf, these saws provide maximum output from every hour of a users' labor by reducing the waste of every cut. Smaller mills can be moved easily in the bed of a truck and are stored in a small barn or large shed. Despite its name, however, a portable saw mill still must be transported by truck or as an integrated trailer. And these devices force a user to maneuver a log to the mill — often requiring a skid steer to extract fallen urban wood from difficult-to-reach locations. It also costs a fair amount and can’t be easily moved to where a tree has naturally fallen. Due to its size, cost and the ancillary equipment required to support it, such a device is better suited to a user who wants to operate it as a business or as part of a larger business. Because professional arborists and sawyers may be cutting thousands of board feet per year, to their profit, and are already likely to own the trucks, forklifts, or front end loaders used to transport the raw logs, the portable bandsaw mill is the right tool for professional users who can justify its cost and size. The woodworker who simply wants to extract otherwise wasted urban wood would find it hard to justify the cost and footprint of even the smallest commercial bandsaw mill. This image from www.woodmizer.com highlights one of the many benefits of the portable bandsaw mill — thinner kerf, less waste. For the woodworker, this means more time spent using the wood and less time harvesting it. An Alaskan saw mill works by providing a fixed cut depth and a rail on which to run a chainsaw down the length of a fallen log. The Alaskan saw mill is a simple jig that attaches to a chainsaw, enabling it to rough cut boards at fixed depths along the length of a fallen log. The Alaskan saw mill provides a portable and low cost alternative to the portable bandsaw mill and couples this to extreme portability. This simple device allows a user to hike to fallen trees — inaccessible to vehicles — and extract boards without the high cost of owning a bandsaw mill and the heavy equipment required to feed it. For users who already own a professional chainsaw, the Alaskan saw mill is an affordable method for occasional milling and likely the best device currently available for woodworkers seeking to sustainably harvest urban wood. For milling extremely large logs, an Alaskan saw mill with dual chainsaws may be the only option. The downside of the Alaskan sawmill is the wide kerf — often 1/4" or more — associated with its chainsaw foundation. This means that for every four cuts taken out of a log, an entire 1" board is wasted to sawdust. For the arborist making the decision between paying to waste drop this wasted wood at a landfill and making a profit on it, this inefficiency may be a non-issue. For the hobbyist trying to make the most out of every log and hour spent outside the woodshop, kerf waste of this magnitude can be an issue. Though the jig that converts a chainsaw to an Alaskan saw mill itself is relatively inexpensive, for those who don't already own a professional chainsaw, the cost of purchasing one and the jig that goes with it can be preclusive. The total can be almost as much as that of a small bandsaw mill. And to mill truly massive logs (e.g. those for giant slab tables) often requires the purchase of a second chainsaw — running in tandem on the same bar — nearly doubling the cost of an Alaskan saw mill. Just as fishermen who start with a spinning reel often switch to fly fishing and eventually to the purity of single fly Tenkara, woodworkers too eventually gravitate toward ever greater levels of purity in their work. The recent explosion of slab-based wood products is just one example of this phenomenon. Examples of live edge and slab furniture — those which celebrate the natural beauty of a large slab of wood — abound in craft ale houses, restaurants and condos as well as every copy of Dwell published since 2010 (along with perfect, albeit perpetually barefoot, children and bowls of green apples). For woodworkers wishing to embrace the purity of this type of work, merely purchasing (at exorbitant cost) a large slab can be dissatisfying. The desire to cut their own is a constant longing. Every craftsman has had the experience of buying a crappy tool and then begrudgingly buying the nice one that you should have bought later, after the crappy one fails. Experienced woodworkers have learned this lesson a hundred times. Those who make it a more serious hobby rarely fail to buy the very best tool they can afford, with the knowledge that it will save them time, money and frustration in the long run. With easy access to information and education, more amateur craftsmen are learning this lesson at ever earlier stages in their practice. Further, frustration with the proliferation of cheap, plastic junk is making zealots out of those who have already learned this lesson. Whether they are experienced or new woodworkers, any user of a Lee Nielsen hand plane will appreciate the rugged elegance of a design that marries high quality materials and processes with a simply functional design. Two exciting technologies that contributed to the development of this device are the proliferation of bicycle hub motors and extremely thin kerf bandsaw mill blades. The availability and increasing affordability of these two technologies make them perfect for adaptation to a new device targeted at a very tiny market — one in which producers can't financially justify the invention of purpose-built motor technology, for example. The e-bike market has exploded over the last ten years — largely around advances in battery and hub motor technologies. Bicycle hub motors — permanent magnet DC motors with integrated planetary gearboxes — offer a low rpm, internally powered wheel with durable mounting components (e.g. 10 - 12mm axles). And thin kerf (.025 - .035 in.) bandsaw blades are likely to allow the use of smaller diameter bandsaw wheels (without causing blade fatigue and failure) and lower torque motors. 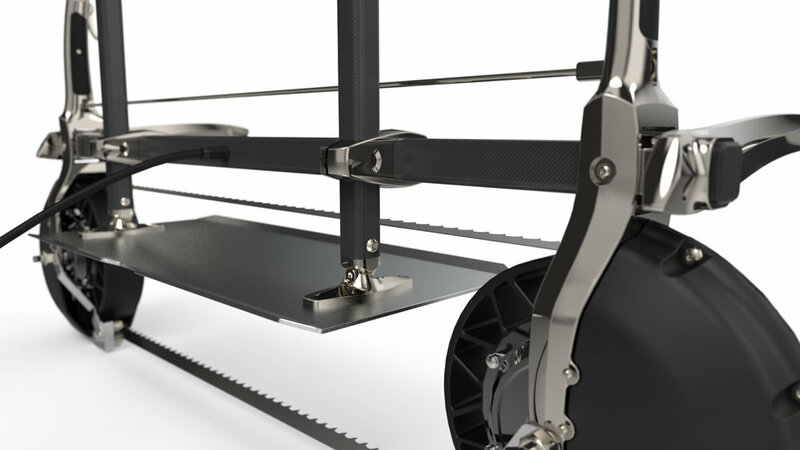 Our design for a portable bandsaw mill marries thin kerf blade technology with dual 500 - 3000w bicycle hub motors and a simple structure inspired by a traditional frame saw. This device allows users who are not professional sawmill operators to mill urban wood on-site with neither the heavy machinery of a portable saw mill nor the kerf waste of an Alaskan saw mill, providing maximum leverage to a user with a minimum footprint. Electrical: To compete with high powered Alaskan saw mills, this design takes advantage of emerging hub motor technology from the e-bike market. Brushless DC motors are paired with an integrated planetary gearbox to deliver extremely high torque at relatively low RPMs. Hub motors are available in multiple levels of output ranging from relatively low power 500W (2/3 hp) to 3000W (4 hp). Providing higher torque than their gas-powered contemporaries and used in tandem with a thin kerf blade, this device should deliver all of the power of an Alaskan saw mill with less kerf waste and much less noise. The device will be wired and able to be powered from a truck, building, portable generator or e-bike battery pack. A Shore 80A urethane wheel is cast around each hub motor (with a mechanical bond through each spoke hole) to increase its diameter and enhance friction on the blade. The motor controller and inverter are housed off-board in a IPX6-rated enclosure cast in glass-filled urethane. Mechanical: The frame of the device is inspired by a traditional frame saw. it utilizes a 1.25" square woven carbon fiber tube as its main compression member. A pair of machined aluminum forks bookend this tube and pivot around an end cap which incorporates an auxiliary handle. Tension is applied to the blade by a rod that runs above the main tube and is threaded on both ends into a pair of opposing aluminum tie rod ends. A flat plate is mounted to the compression tube and can be adjusted up or down to determine the thickness of the slab to be cut. The plate is long (like a jointer plane) to ensure a cut that is consistently parallel to its guide. Adjustment rods can be moved independently and pivot at their base for angled cuts. Square carbon tubes ensure alignment, and a small window in each clamp allows operators to see depth markings (not shown). Usability and Safety: The vertical handle is for pushing the saw along the length of the log and houses the trigger which activates the device. The horizontal handle steadies it. For safety, the device can only be operated when both triggers are depressed. This prevents an enterprising operator from trying to manhandle the saw by himself and ensures that both sides of this high torque device are secure before it's started. A pair of mirrored bearing sets guide the cutting portion of the blade and prevent it from riding off of the wheels. A pair of matched covers protect operators from the blade. Each cover is cast in glass-filled urethane to capture and absorb the energy of a blade that comes loose (rather than letting it rattle through a steel guard and into its operator). Due to the extremely low volumes at which this device will likely be sold, it was important to design it with as few molded components as possible. This reduces the cost of tooling — the debt of which would have to be amortized across every unit. It also allows us to deliver a high quality, made-on-demand device with no plastic components other than the CRP tube. This provides the added advantage of allowing us to customize the device for every customer by offering it in varying widths (e.g. 36", 48" 60", etc.) and finishes. To order, a customer will simply select a finish and a length. The unit will be shipped in two boxes — one containing the handles, electrical components and hardware, the second containing the compression tube, blade and tension rod. All machined aluminum components will be anodized or plated to customers' specifications, based on a list of available finishes. Flush grips are set into each handle and will be crafted from solid, CNC-machined wood (of the customer's choice) or cast in urethane. The images above show the device in nickel with walnut handles. The gallery below shows multiple anodization and plating options. A customizable, large scale power tool, made in the USA of CNC-machined aluminum, carbon fiber and with two 3000w brushless motors is not going to be inexpensive. Further, for woodworkers in search of higher levels of purity in their practice, a powered saw mill may not be the perfect solution. For both these reasons, the Pixel and Timber team developed a second version of this device that provides still greater purity (and exercise). For more information, check it out here.